They say “a thing of beauty is a joy forever," I wish that were so. Penny Park was a thing a beauty, and a good thing, but "all good things must come to an end" or so they say. I remember we would take youth groups over to the park site when it was being built so that they could help with its construction. The community of Silver City pitched in, and built something nice for the children. It was not only for the kids, but it was a family park. We would take students to Silver City on a field trip, and often no matter what they went up for, going to Penny Park was on the agenda. It had an amphitheater, and gazebos. 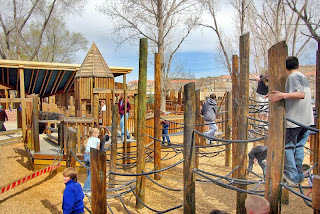 It had the most beautiful wooden playground that a person could imagine. It was treasure. I hope with all of my heart that the town of Silver City rebuilds it just like it was, but with security measures in place. 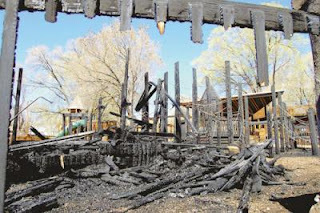 SILVER CITY — The state fire marshal's office has been called in to help with the investigation of Saturday's fire that burned a large portion of Penny Park, authorities said. "It appears it may have been caused by fireworks," police chief Ed Reynolds said. No injuries were reported and no damage estimate was provided. The fire was called in about 2 a.m. by a police officer who saw the fire and smoke from a hilltop. "We are working every possible angle on this fire," said Milo Lambert, Silver City fire marshal. "We have called in the state fire marshal and we expect them to be here anytime." The police department also is conducting an investigation. Firefighters had the fire out by about 4 p.m., authorities said. Lambert praised firefighters for saving the amphitheater and other nearby structures. "The fire was so hot it melted those plastic slides over there (yards from the fire)," he said. Police had to coordinate traffic control into the afternoon as people drove by to see the damage. A grassroots effort began about 10 years ago to build the park, with volunteers and businesses giving of their time and materials. Wood was a prominent feature in the construction. While officially called Community Built Park, it was dubbed Penny Park because children brought their loose change to school to donate to the cause. A crowd of people, including many who helped build the park, gathered Saturday, some visibly shaken and crying. "I raised my son here," said Janet Wright, who had tears running down her face. 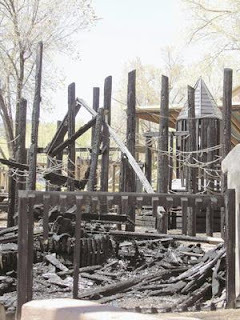 She and others had already begun to collect donations to help rebuild the park. "It helps me not to be so emotional," she said. "I love this park ... it's hard to talk about it." Doug Shoaf was among those who helped build the park, which featured. "I put in all this for the kids. You should have seen all the people here working on this." Members of the Silver Sam's RV Club were also looking over the damage Saturday. "We had RVs parked here when we were building it and someone stayed here so no one would steal the tools or building materials," said Sally Lucero. "We helped build this from the beginning. It is so sad, my grandkids come here." 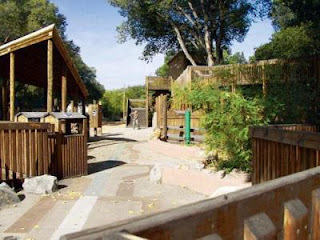 Earlier this year the group overseeing the park disbanded and turned ownership over to the town. "The park is covered by insurance," town manager Alex Brown said. "To what extent we don't know. We will have to wait until we meet with the insurance people on Monday."